Ignorance (Skt. avidyā; Tib. མ་རིག་པ་, ma rigpa, Wyl. ma rig pa): Fundamental ignorance of the truths and the delusion of mistakenly perceiving the skandhas as a self. Formation (Skt. saṁskāra; Tib. འདུ་བྱེད་, duje, Wyl. 'du byed): As long as there is ignorance there is the formation of karma: positive, negative and neutral. This forms the rebirths in the various realms. Consciousness (Skt. vijñāna; Tib. རྣམ་པར་ཤེས་པ་, nampar shepa, Wyl. rnam par shes pa): Formations cause the consciousness of the next existence. The consciousness which propels one towards the next existence is called the impelling consciousness. And the consciousness that is led to that particular state, once the conditions have come together, is known as the consciousness of the impelled result. These two aspects of consciousness are counted as a single link since together they establish the link between two lives. Name-and-form (Skt. nāma-rūpa; Tib. མིང་དང་གཟུགས་, ming dang zuk, Wyl. ming dang gzugs): The five skandhas. By the power of consciousness one is linked to a womb, and there the body develops: the form and the four ‘name’ skandhas of sensation, perception, formation and consciousness. The six ayatanas (Skt. ṣaḍāyatana; Tib. སྐྱེ་མཆེད་དྲུག་, kyemche druk, Wyl. skye mched drug): The six inner ayatanas of the sense faculties then arise. Contact (Skt. sparśa; Tib. རེག་པ་, rekpa, Wyl. reg pa): The coming together of objects, sense faculty and consciousness is contact. Sensation (Skt. vedanā; Tib. ཚོར་བ་, tsorwa, Wyl. tshor ba): From contact arises sensation: pleasurable, painful and neutral. Craving (Skt. tṛṣṇā; Tib. སྲེད་པ་, sepa, Wyl. sred pa): There then develops a desire not to be separated from pleasurable sensations and to be free from painful sensations. Grasping (Skt. upādāna; Tib. ལེན་པ་, lenpa, Wyl. len pa): As craving increases, it develops into grasping, i.e. actively striving never to be separated from what is pleasurable and to avoid what is painful. Becoming (Skt. bhava; Tib. སྲིད་པ་, sipa, Wyl. srid pa): Through this grasping one acts with body, speech and mind, and creates the karma that determines one’s next existence. Rebirth (Skt. jāti; Tib. སྐྱེ་བ་, kyewa, Wyl. skye ba): Through the power of this becoming, one is reborn in a particular birthplace whenever the necessary conditions are assembled. Old age and death (Skt. jarā-maraṇa; Tib. རྒ་ཤི་, ga shi, Wyl. rga shi): Following rebirth there is a continual process of aging as the aggregates change and develop; and eventually there is death when the aggregates finally cease. Karmic formations - A potter shaping a vase on a wheel. The pots the potter makes symbolise the actions of body, speech and mind with which he moulds his karma in the wheel of life. Karmic imprints or traces from actions in previous lives affect our present and future lives in the form of certain propensities, just as the potter’s wheel keeps turning after a single push. Consciousness - A monkey swinging from a tree. The monkey represents our consciousness, the way we tend to spring from one thought to another in an uncontrolled manner. Name and form - A person (or people) on a boat. The five skandhas that make up our sense of ‘self’ need a physical body: form (the boat) and a psyche: name (the mental skandhas: feeling, perception, mental formations, consciousness). Six sense organs - A house with five windows and a door. 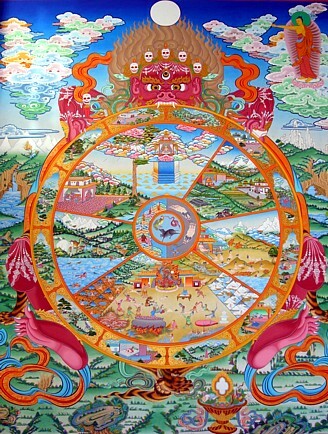 This symbolises the six senses by which the outer world is perceived. In the wheel of life they are represented by an empty house because this is a time when the organs of the embryo are developing but not yet functioning. This page was last edited on 2 February 2019, at 03:16.